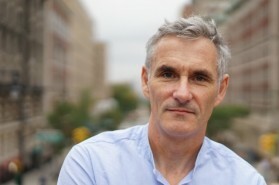 Brian Larkin is Professor of Anthropology at Barnard College and Columbia University and the author of Signal and Noise: Media Infrastructure and Urban Culture in Nigeria (Duke University Press, 2008). With Lila Abu-Lughod and Faye Ginsburg he co-edited Media Worlds: Anthropology on New Terrain (University of California Press, 2000). His research examines the introduction of media technologies in Nigeria – cinema, radio, digital media - and the religious, political, and cultural changes they bring about. He has published widely on issues of technology and breakdown, piracy and intellectual property, the global circulation of cultural forms, infrastructure and urban space, sound studies, and Nigerian film (Nollywood). Larkin is completing the manuscript "Secular Machines: Media and the Materiality of Islamic Revival," which analyzes the role media plays in the rise of new Islamic movements in Nigeria and explores theoretical questions about technology and religion. With Stefan Andriopoulos he co-directs the Center for Comparative Media at Columbia University. He is a board member of the Institute for African Studies and the Buell Center for American Architecture at Columbia University and a member of the Committee in Global Thought.